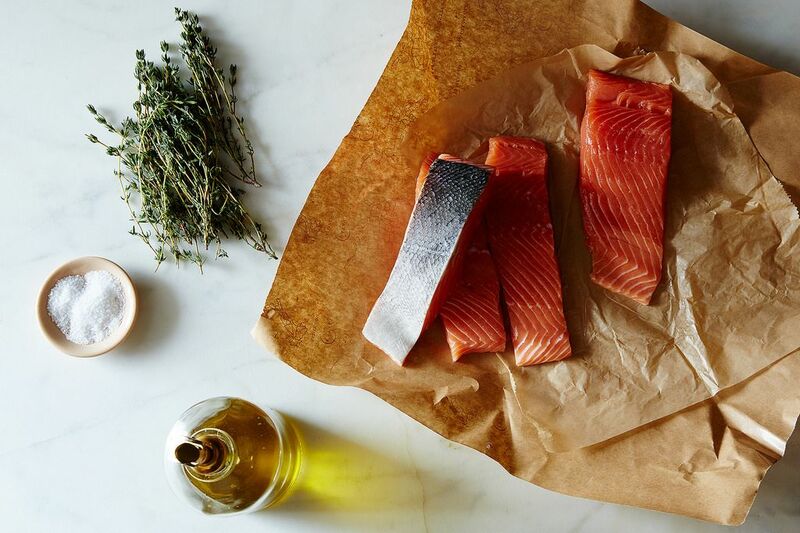 Today: The most foolproof way to cook any fish—and a petition for a new cooking term. The most unfair implication of slow-roasting is the slowness part. Sure, there are plenty of benefits—gentler cooking, a cooler kitchen, a both technique- and zen-driven lifestyle—but speed (and, by association, weeknight-friendliness) isn't one of them. Or is it? Unlike slow-roasted pork or chicken or even tomatoes, the perks that come along with turning down the oven happen to come much faster with fish, as most things do. Fish needs a new marketing campaign: Fish is always fast. Its connective tissue and protein structure are more delicate than those of other meats, says Harold McGee, and should generally be cooked as little as possible. And so, fish is the only case where slow-roasting can take as little as 15 minutes. Low-roasting would be more accurate than slow-roasting—we should start seeding a change in terminology, and tell Google about it. 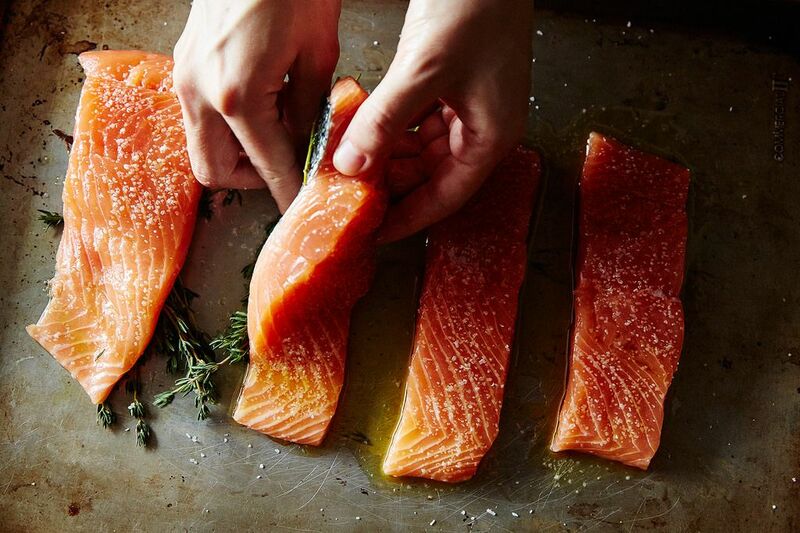 There are all sorts of variations on the idea—Michel Bras and Paula Wolfert famously added a pan of boiling water to the bottom of the oven to help the fish steam; Alice Waters tops her slow-cooked fish with a perky lemon relish; and our own Erin McDowell translates the method to a cold pan on the stovetop. But perhaps the simplest, fastest, and most versatile slow-roasting technique comes from Sally Schneider in A New Way to Cook. All you need: a thin coat of olive oil, salt, and a 275° F oven. Schneider learned about the technique for salmon close to 20 years ago, she wrote to me, "So I asked, 'What if I applied it to other fish?' and tested them out to discover that the dead-simple technique works great for all sorts of fish and shellfish"—from striped bass and cod to sea scallops to steakier fish like tuna and swordfish. 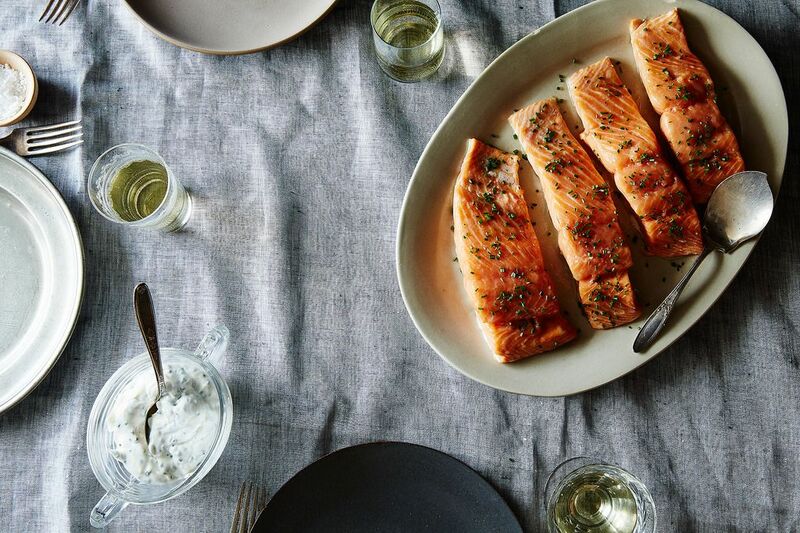 Slow-roasting makes a beautifully tender, evenly cooked, not-one-bit-dry piece of fish. If you miss the 120° F, just-starting-to-flake mark, it will still be good—even carryover cooking after taking it out of the oven won't outrun you, because there isn't much velocity behind it. 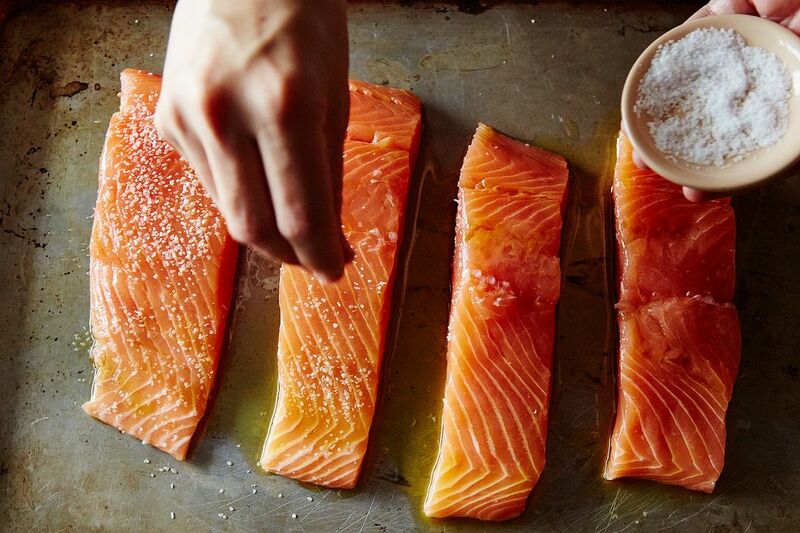 This makes the technique perfect for dinner parties and newer fish cooks, whom the "Fish is always fast" marketing will hopefully reach soon. "Over the years, it’s proven to be an essential technique I’ve riffed on endlessly," Schneider told me. "You slow-roast the fish, then embellish it any way you want or with whatever is on hand; therein lies the opportunity to improvise." In her later version in The Improvisational Cook, she suggests all kinds of sauces, from fennel oil to brown butter and vinegar. I topped mine with Greek yogurt speckled with chives. Years ago, I learned a memorable analogy about speed and cooking from my friend Anita Shepherd, after I burned a pan of bacon and had to ride my bike around Little Italy looking for another package late at night—this was before she became a vegan chef and coconut milk yogurt developer (and before I cooked bacon for dinner more often than I should). She told me cooking is like coming up to a stop light. If you're going slowly, it's easy to hit your mark. If you're going fast, you'd better hope that you have very good aim (and strong brakes). Low (née slow) roasting is fish's built-in brake. Note: To find up-to-date sustainable seafood recommendations, check out Seafood Watch or other sites or apps before heading to the market. Got a genius recipe to share—from a classic cookbook, an online source, or anywhere, really? Please send it my way (and tell me what's so smart about it) at [email protected]. 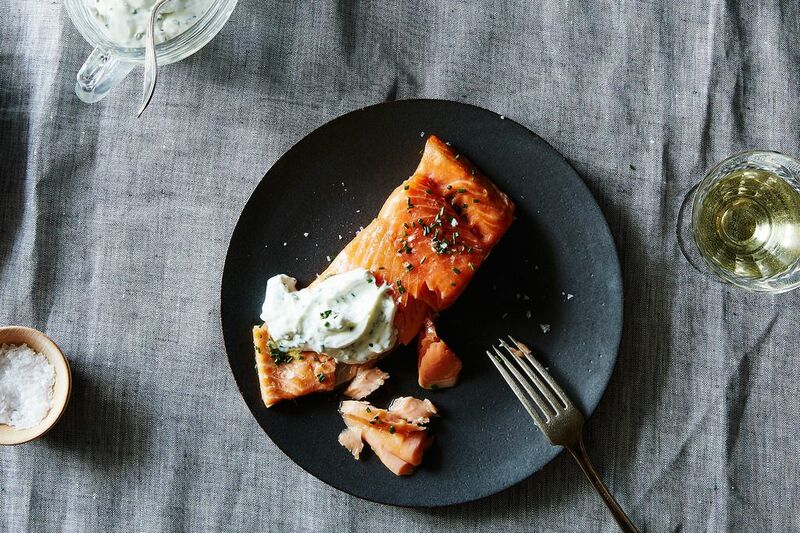 Thanks to Food52er linzarella for this one! This method is excellent! No mess, easy, delicious! Try sous vide cooking. It can be flawless with the right chart, and hands off cooking. Naw! too time consuming, ok with meats, but not fish! Just as I decide to go pescatarian, THIS excellent advice comes to me! Like a comet through a night sky! A sky filled with dry fish but NO MORE! Many thanks, from Seattle. This comment made my day. Welcome to gently cooked salmon (and other fishes)! I agree that this is a great way not to overcook salmon. The only thing is that the fish really isn't very hot when done. Somewhat of a small price to pay if the fish is perfectly cooked, but sometimes I really do want the fish hot. Sous Vide all the way, you can't over cook it! I'll never cook fish/salmon or chicken breast another way. It takes more time but WELL WORTH IT. I agree completely. If you want your fish to be hot, just sear it with butter or olive oil and garlic when it is finished and you have a masterpiece. You will never return to the traditional way cooking salmon again. Fine for anything but fish, makes it mushy! Food52 - Where is that gorgeous Oil Cruet from in the pictures?! This was the first I ever read about slow roasting. 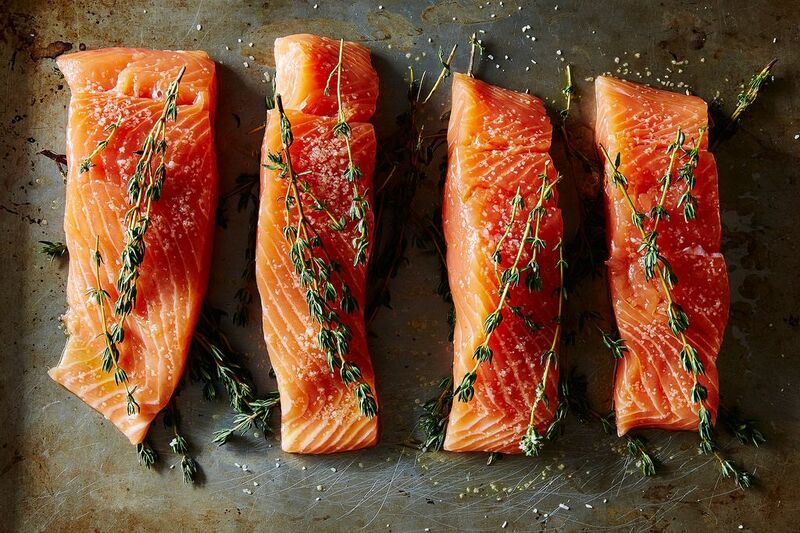 That salmon looks perfect & fabulous and I don't even like salmon. I ran home last night & prepared the fresh piece of monk fish I had from Anthony's in Middletown, RI. I slow roasted almost as you explain here. I thinly coated the bottom of a Pyrex loaf dish w/olive oil and thinly sliced garlic. While the monk fish slowly cooked I prepared a corn salad of RI native corn from the cob boiled for 5 - 7 minutes until I caught it's aroma, minced red onion & jalapeno, olive oil & Salt of D Earth Rhody blend. AND I steamed off a pound of steamers. I poured the steamers and some of their broth the last 5 minutes the monk fish roasted. I read about this a year or so ago and now swear by the low and slow method for my salmon. Incredibly simple and excellent! 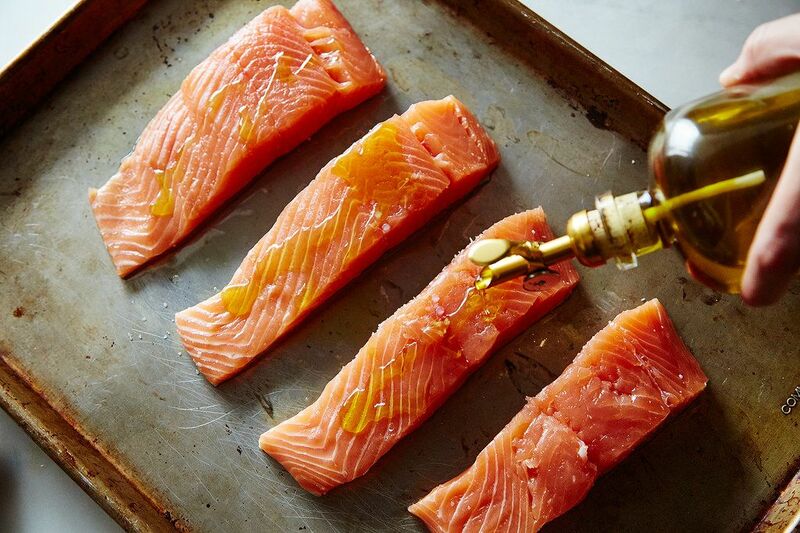 Rub Salmon filets with olive oil on both sides. I like Cajun seasoning which I alpply to flesh side. Spray an iron frying pan liberally with cooking spray and place on a gas grill. Place fillets, flesh side down into pan and cook 3-4 minutes depending on thickness of fillets. Turn them over and repeat for skin side. Fillets will be nicely browned and very moist. This method works perfectly every time. I have had satisfying results with all kinds of fish, baking it in parchment. This method intensifies the flavor of fish and herbs, while minimizing the cooked- fish odor that might otherwise permeate the kitchen. And there is no pan left to clean. With this method, temperature and time can easily be adjusted as recommended above. 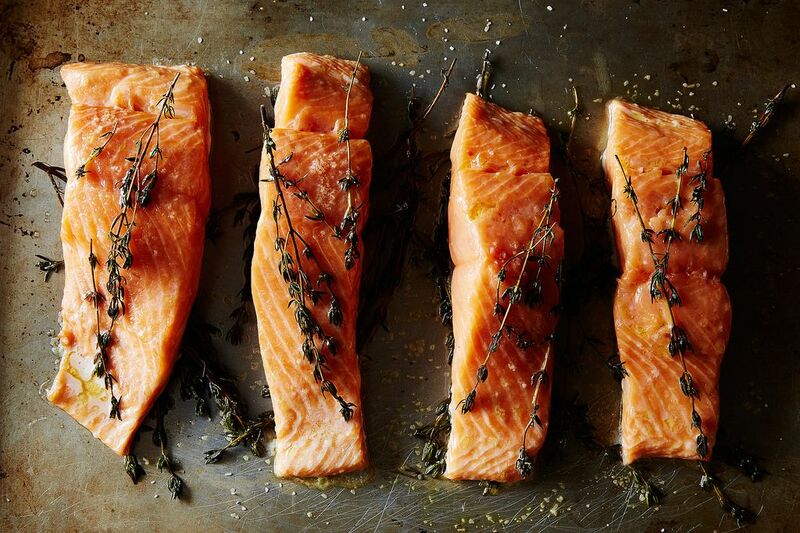 Love it : ) you know, we love salmon a lot in my home, and I've been playing with slow and low here and there since a Bon appetite recipe featured it last year. A few things I personally find make me happier with the technique: I use a thinner long slab of wilds salmon rather than thick filets. And since my oven starts at 300 I find 20-22 mins is perfect. The current salmon I'm getting-sockeye, seems leaner and this is a great application. Thanks Kristen! That is a great analogy! 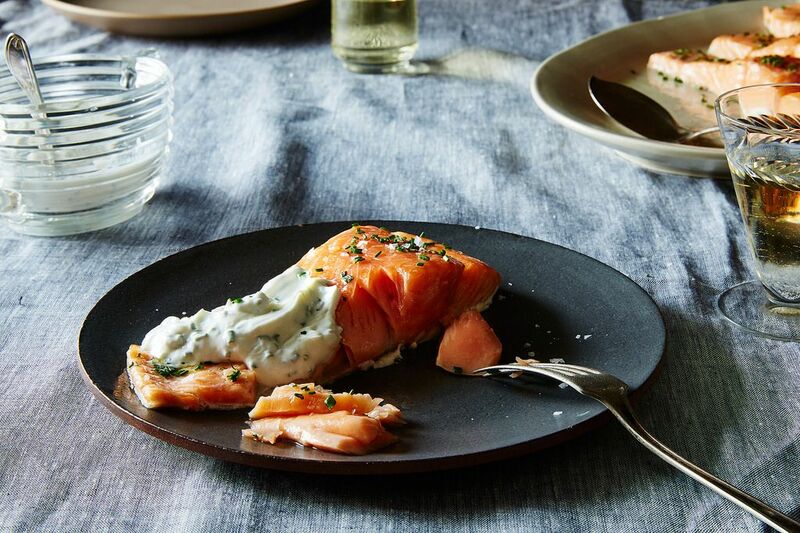 Salmon looks great, too. Much as I'd embrace a full discussion of fish v. fishes, farmed v. wild (absolutely no offense meant to anyone! ), I do want to call attention to the genius method, which I put to use so regularly I think it's my own. I commented on the recipe page, noting that I use an even lower temperature. BUT, if I have a genius recipe in my repertoire, its slow- (or low-) roasted salmon. In fact, I'm headed down to my kitchen right now. My (local) salmon awaits! A New Way to Cook is one of my all-time favorite books. Can't believe I've never tried this one! Very excited. Love all of Sally Schneider's recipes. Shoot, I got too excited about the Sopranos -- excuse me: episodes. You are right, it's fishes for species, good job being ichthyologically correct! I LOVE that website. I just had to tear myself away from it, lest I get nothing at all done today. Thanks!